Daisy Duck is a survivor in the cut throat world of Disney politics. She attributes her success to a firm hand and feminine wiles. Daisy Duck is an ambitious female duck who is one of the ten members of the Great Council, which rules over the confederation known as Disneyland, in California. Daisy Duck used to be one of the most aggressive and ambitious members of Disneylands political elite, even going as far to fight her own husband for control of Disneyland. Daisy was born on July 12, 1942, to a prominent family of ducks named Duck, who lived on Duck Farm, situated on an island off the coast of Maine. Daisy was a rebellious child, constantly torturing the other animals of the farm, painting the barns green instad of red, and flirting with the other ducks on Duck farm. Finally, at the age of 24 in 1966, Daisy Duck was kicked off the Duck farm and sent out on her own. Contrary to what her parents thought, this is exactly what Daisy wanted. Daisy had been watching Disneyland's recruitment commercials ever since she was born, and found their take-charge style very attractive to her main ambition in life: to rule over a nation with her iron feathered fist, and also to bake the perfect pie. Daisy flirted her way onto a Boeing commercial plane to Anaheim, a nearby city close to Disneyland. Once landed, Daisy immediately snuck into Disneyland, and found herself caught while in Tomorrowland. At the time, Disneyland was ruled by Mickey Mouse the Great, a powerful dictator who ruled Disneyland and was very militaristic. As another precaution, he also strictly regulated the visits of outsiders through an arbitrary ticket system (see Disneyland). Mickey ordered the intruder before him, and Daisy showed her rebelliousness and ambition by attempting to escape, managing to incapacitate a few guards until she was finally restrained. Greatly impressed, Mickey, rather than enslave her on Its A Small World in traditional fashion, decided to put her to good use, and appointed her to his personal offices. Daisy started her Disneyland political career there, as a lowly secratary. While there, she took care of the "dirty work" of destroying incriminating files. Many of these files involved a political and military star, Donald Duck. Through this, Daisy begin to so see Donald frequently, and she gradually fell in love. What started with a crush, then flirting typical of her, became much more for Daisy Duck. Daisy and Donald began a courtship, one that Mickey mysteriously approved of. After almost a year of dating, in 1967 the two decided to get married. The wedding was private, but largely talked about. Held at the base of Space Mountain, it was attended by the friends and families of both spouses, and many prominent members of the political ranks in Disneyland, including Mickey Mouse himself. They were married by the honorable "judge" Goofy, who thanks to his recent connections to the Mafia, was able to gain a fake license identifying him as an honorable judge. He used to this to make money on the side, and was paid for this wedding handsomely. After the wedding, Daisy and Donald received permission from Mickey Mouse to leave Disneyland for their honeymoon. They decided to go to New York City, for reasons unknown. After the honeymoon, Daisy moved into Donald's estate in Tomorrowland. There, she came accustomed to the lifestyle of the wealthy, while her husband was off much of the time on duty. There, Daisy began making political connections, and hosting parties for the other wives of those among Mickey's inner circle. Gradually though, Daisy grew bored with throwing parties and decided to do what her ambition was begging for, and find a way to rise even further in the political ranks. She started supporting Mickey Mouse's regime outright rather than quietly, and began scheming to get in among his inner circle. To do this, she began using subversive tactics. She found a way to implicate that one of Mickey's chief advisors, Pluto the Dog, had laundered money from Mickey's personal bank accounts. When presented with the "evidence" by none other than Daisy herself, Mickey grew furious and exiled Pluto to Mauschwitz. Pleased with her "uncovering" of the laundering, Mickey accepted Daisy into his inner circle. Daisy couldn't have been more pleased. Or could she? Over the next couple years, leading up to 1970, Daisy became a central figure among Disneyland's elite and politicians, and, as part of her scheming, supported Mickey in everything he did, in order to further gain his trust. By the beginning of 1970, Daisy had come up with her most ambitous plan yet. She decided to murder Mickey, than in the subsequent chaos, take over Disneyland and install herself as Empress. She managed to dig up an old and forgotten recipe for the poison apple that was used in an attempt to kill Snow White. She was able to perfect the recipe (as it did not kill Snow White, only came close), and prepared to give it to Mickey. While talking to Mickey alone one day in early April, Daisy offered the apple to Mickey as a gift. Mickey ate it all up unwittingly, and went on his affairs as ruler, while Daisy craftily smiled on her way home, knowing it was only a matter of time. Gradually, Mickey grew ill, and the doctors were baffled by his condition. On April 20, Mickey Mouse the Great died surrounded by family and friends, including Daisy and her husband Donald. After his death, chaos ensued, exactly as Daisy had foreseen. Donald Duck, who was loyal to Mickey's form of government, lead a military junta to continue Mickey's form of rule. Daisy now found herself at odds with her husband, and despite her love for him, she would not allow her ambitions to go unfulfilled. She began attracting supporters and vying for power, going as far as hiring hitmen to take Donald out. Ultimately, Daisy's power grab failed, as did Donald's. The people were the victor, having protested and called for democracy, and had met with the military leaders to negotiate. A new democratic government, with a new constitution was established. Daisy knew she had failed, and quickly moved to find new footing. After the new form of government, rule by a Great Council, took hold, Daisy found herself politically powerless. Due to her prior vehement support of Mickey's regime, she found herself without allies among this new government. As her first step to regain her footing, Daisy managed to reconcile with Donald, and their relationship quickly became stronger than ever. Soon, Daisy had veiled any evidence that could lead to the revalation of Mickey's cause of death. Gradually, Daisy began to emulate what she had done during Mickey's reign: support whoever seemed to be gaining power and exploit it to her advantage. 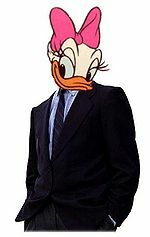 She eventually joined the Donald Duckocrats party, and once more became a politcal star. Eventually, Daisy garnered enough supporters to allow her to run for a seat in the Great Council, representing Tomorrowland. She won the following election by a landslide, and found herself a major player within the Great Council. Daisy continued onward from that position, still dreaming of what could have been. Daisy continues to hold a seat on the Great Council, having won reelection after reelection as a result of her perpetually increasing popularity. She remains happily married to Admiral Donald Duck, through his retirment and death by old age in 2008. As far as she knows, the public has yet to uncover the truth behind Mickey's death. Daisy, though in old age, is active among Disneyland's elite, and, so long as her ambitious drive doesn't slow, will surely continue to do so. In A.D. 2112 Madonna played her in the biopic "Daisita". The film was a flop, but it did yield Madonna's Top 20 single, "Don't Quack For Me, Disneyland". This page was last edited on 8 March 2012, at 22:43.